→How To Stop Dog Nails Bleeding Quickly? How To Stop Dog Nails Bleeding Quickly? Dog nails bleeding is an all-too-common occurrence that can be handled quickly, cleanly and with minimal fuss with the right preparation and tools to hand. Dog nail clipping is often an unpleasant time for both pet and owner. Few dogs submit to nail clipping easily, and if your pet has suffered from a painful or bloody clipping before, they may be downright uncooperative and struggle. No pet owner likes to see their pet distressed, so getting through a nail clipping quickly and cleanly is always the best scenario. However, in the unfortunate instance that you clip a little too high and cause nail bleeding, quick action and the right products will minimize the stress for both pet and owner. I began researching this subject after a particularly nasty clipping session with my Staffordshire Bullterrier. With a jet-black coat, her nails are unfortunately also completely black, so choosing the right place to clip is extremely tricky. All had been going well, and the length I chose to clip seemed to be fine, until on one toe she let out a heart-rending yelp, and her nail began bleeding steadily. The worst part was that I wasn’t prepared at all. I had nothing nearby to staunch the flow, or to treat it, and after a panicked hunt for kitchen towel and bloodstains on the carpet, I bundled her into the car and raced to the vet. Why ﻿Should I ﻿Cut ﻿﻿﻿M﻿y﻿﻿﻿﻿ ﻿﻿﻿D﻿og’s ﻿﻿N﻿ails﻿? When Should I Cut My Dog’s Nails﻿? Where ﻿Should﻿ I Cut ﻿﻿The﻿﻿ Nails? What Do I ﻿Do﻿ If The Nail Starts ﻿﻿Bleeding﻿﻿? For working dogs or outdoor dogs that spend a lot of time on rough outdoor surfaces, their nails naturally wear down whilst they’re being active. However, for dogs that spend a lot of their time indoors on carpeted or smooth surfaces, the nails do not naturally wear down, and can grow too long. Unfortunately, the longer a dog’s nails grow, the longer the quick grows inside them as well, making it harder to cut them down to the correct length, so it’s important to keep your dog’s nails trimmed. If you can hear a dog’s nails clacking on the floor as they walk, then they are too long. Allowing a dog’s nails to grow too long for lengthy periods without clipping can eventually cause injury to your pet’s paws. What ﻿﻿﻿Causes﻿﻿﻿ Dog﻿ ﻿﻿﻿﻿Nails﻿﻿﻿﻿ Bleeding﻿﻿﻿? Within each of your dog’s nails is the quick, which contains a blood vessel and nerve ending that keeps the nail healthy and gives them feeling. In a white nail, the quick is usually clearly visible as a pink core. On a black nail the quick can be more difficult to spot, sometimes being a slightly paler grey color. If you cut too close to the quick, you may cut the quick itself, and this will cause bleeding. You should cut the nails with proper dog nail clippers purchased from a pet store or vet surgery. Human clippers are not suitable, and may cause damage to your pet’s nails. You should cut them at a downwards-facing angle at the point where they begin to curl towards the floor. Try to see where the quick is, and avoid cutting into it. Now we come to the crunch of it. 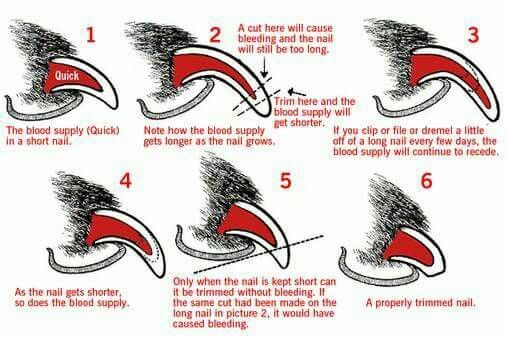 Here I’ll outline the remedy that I’ve found effective for treating a bleeding nail on my dog. Thankfully, I’ve only had to use it once since the incident, but it worked immediately. Styptic powder - Kwik Stop is a common brand that has worked well for me. The styptic powder contains ferric subsulfate, an ingredient that contracts blood vessels to stop bleeding, and also acts as an antiseptic. If you’re repeating my mistake, and are reading this article frantically after catching the quick on your dog’s nail, then fear not. If you don’t have any styptic powder to hand you can use baking ﻿flour or cornstarch instead. They don’t have the same properties as styptic powder, but they will staunch the blood flow if packed into the end of the bleeding nail. Apply in the same manner as above. Immediately staunch the flow of blood with the paper towels or rag. Hold it there for a few seconds to slow the bleeding. You should have a good hold on your pet to make sure they don’t escape. Once your pet is calm, cup your hand, and pour some of the styptic powder (or baking flour/corn starch) into your hand, making a small pile. Press the bleeding nail into the powder gently but firmly. You want the powder to pack into the end of the bleeding nail. Styptic acid can sting a little for a second or two, so again, make sure your pet doesn’t scrabble free. Alternatively just rub some powder into the end of the nail with a fingertip. Bind the paw in a bandage to stop your dog licking or worrying the nail. This is only temporary, and won’t need to be on for long. After the paw is treated, it’s advisable to try and keep your dog off of its feet for around twenty minutes, just to give the nail time to seal up. This might involve a twenty-minute petting session that will surely earn you forgiveness! We hope that you’ve enjoyed this article and found it useful. We also hope that you’re reading this advice before you actually need it so that you can prepare in advance, and be ready for any mishaps. If you liked the article, please share, and let us know your thoughts on the subject in the comments below.